For more than a decade Castle has been providing award winning brushless sensorless motors to R/C enthusiasts worldwide. In response to overwhelming requests by our customers, we have brought technological advancements together that will deliver unprecedented performance in our new SENSORED motor line. Drivers in all applications demand clean starts when coming off the line. Crawler fans require high-precision low speed control and torque for climbing, racers need precision and predictability, and dragsters don’t have a millisecond to spare. To achieve all of these performance demands and more, we have integrated rotor position sensor technology with our improved high power and high efficiency motor design. Through the use of our sensors, the position of the rotor is always known by the ESC. This eliminates the possibility of encountering cogging or inconsistency during startup. Users will experience PRECISE throttle control and BUTTERY SMOOTH starts plus the RAW POWER and LONGER RUN TIMES that our highly efficient motors produce. WHAT MAKES AN EXCEPTIONAL MOTOR? Without a robust and reliable design, efficiency will only go so far. RC enthusiasts love pushing their equipment to the edge. The Castle engineers know this and spared no expense when developing a design that could hold up to the harsh conditions that the RC community will throw at it. Oversized NMB bearings and vibration dampening system ensure the longest bearing life possible. High-strength, high-temperature grade neodymium sintered magnets combined with a high-strength Kevlar wrap ensures the integrity of the rotor is not compromised during harsh running conditions. Our proprietary winding techniques allow us to produce a stator assembly that is the lowest possible resistance, resulting in a cooler running motor. A cooler motor has a longer lifetime. Construction of our motor required careful component selection; each verified through internal testing to ensure the highest efficiency possible. In the end, the result is a motor with unmatched quality, performance, and reliability. We wouldn’t put our name on anything less. Our IMPROVED 4-POLE 12-SLOT design boasts exceptional EFFICIENCY and produces LESS HEAT. QUIETSENSE™ technology shields the sensors from magnetic field noise generated from the motor coils and keeps your motor and ESC in sync at all times. Use of a Flux Shield™ in conjunction with secondary Sense Magnets delivers even HIGHER PRECISION and MORE EFFICIENT startups. Our OPTIMIZED design eliminates the need for mechanical timing adjustments. Our sensor alignment method delivers uniform timing and torque in both directions, automatically. REBUILDABLE design allows users to replace front end bell/bearing assembly or rotor/shaft assembly. ROAR standard sensor port and labeled connections. Updated modern and sleek design; looks as cool as it performs. Pictured above is the Castle 1406 sensored motor magnetic flux simulation. Simulations are an important part of the design process ensuring optimal magnetic design. Immense care is taken by our US design team during every step of the development process. While using the highest quality components is important, design is equally important. Our experienced, in-house engineering team, located in Olathe, Kansas, has spent countless hours simulating and developing the most efficient design. Development includes magnetic simulations, custom winding techniques, and rigorous, real-world testing of the final product. You will reap the benefits of longer run times on one battery and a cooler running motor that can be pushed harder. Castle engineers always add a little something extra in their designs that takes your performance to the next level. We have not skimped here. Many customers have utilized our industry leading software functionality that Castle Link* offers. 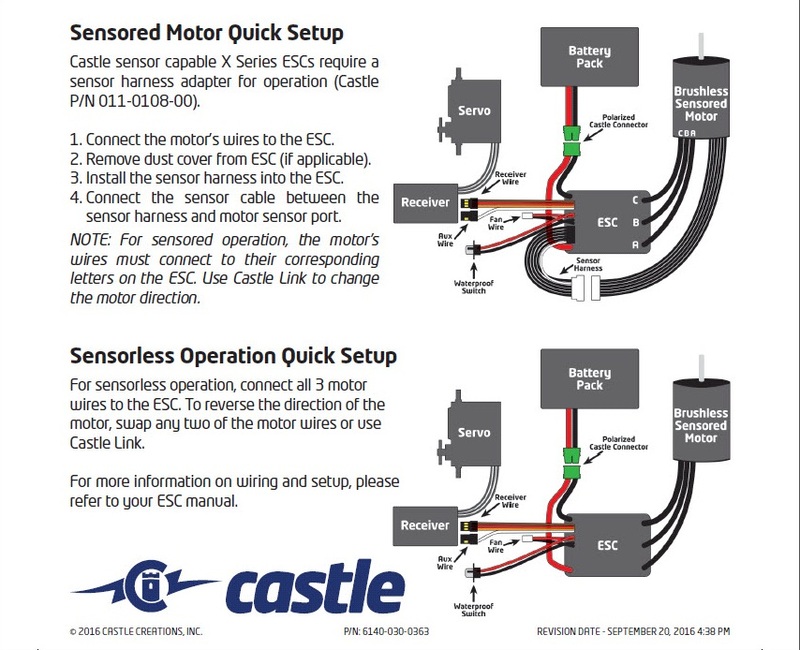 When paired with a Castle Creations sensor supported ESC, like the MAMBA MAX PRO, MAMBA X or MAMBA MONSTER X, you can unlock advanced tuning capabilities that Castle Link provides specifically for sensored motors. SMARTSENSE™ uses the motors sensors to start the motor to provide smooth starts, excellent torque, and low-speed drivability. Once the motor is turning, it seamlessly transitions to Castle’s ULTRA- EFFICIENT sensorless mode. When running, a motor must transition between different load points and a different timing advance is required for optimal efficiency at all load points. Using mechanical timing adjustments alone, you can only target one driving condition, such as higher start power or higher top end speed. This sacrifices performance and efficiency during the other driving phases. Electronic timing in SMARTSENSE™ will advance timing automatically for peak performance during all driving conditions. This allows users to combine the best of both worlds in an unrivaled HYBRID between smooth sensored startups and high-efficiency sensorless drive. With a Castle sensored ESC and sensored motor you will have the ULTIMATE POWER PLANT for your vehicle. Users will experience PRECISE throttle control, BUTTERY SMOOTH starts, PEAK PERFORMANCE and EFFICIENCY throughout the full throttle range. You will feel the POWER and LONGER RUN TIMES that a WORLD-CLASS motor produces. It’s not magic… it’s SMARTSENSE™. Cooling Fan: Optional, coming soon! Connectors: 6.5mm male Castle Bullet Connectors, includes 210mm length sensor wire. Running modes: SMARTSENSE™, Sensored, Sensorless with Castle sensored capable ESCs. Water Resistant Design: The sensor board is coated with silicone conformal coating to protect the sensors from moisture. The sensor connections are not water resistant; water can cause signal loss which could result in loss of sensored capabilities. Castle recommended applying dielectric grease to the outside of the sensor wire connections after installation of the wire. Routine maintenance is recommended after running in wet conditions. Please refer to this document for running and maintaining motors in wet environments. *Software downloadable at no cost from www.castlecreations.com/downloads, and requires a Castle Link USB adapter and USB enabled Windows™ PC. This is a high power product with the potential to be very dangerous. Please read the safety information before use. This product may contain chemicals known to the State of California to cause cancer and or birth defects or other reproductive harm. Motor designed in Olathe, Kansas USA.